The Biome seats the driver in the middle up front, with two passengers slightly further back on either side and third passenger in the back. 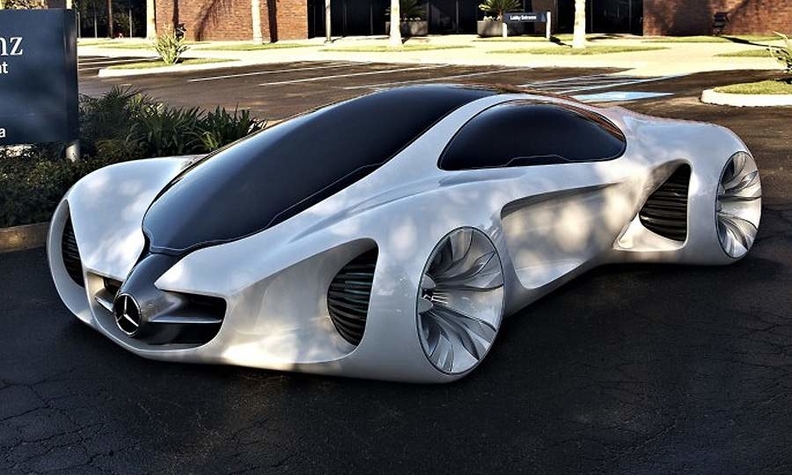 Mercedes-Benz has created a spectacular looking concept called the Biome. The sleek four-seat model was created at Mercedes' advanced design studio in California by studio head Hubert Lee -- the man behind the aggressive new look of the second-generation CLS unveiled at the Paris auto show in October and the F700 Style concept car shown at this year's Geneva auto show. The concept has a diamond-shaped seating arrangement that sites the driver in the middle up front, two passengers slightly further back on either side and a third passenger in the back, facing the rear. Sources says the concept, a full-sized model, will be revealed to the public for the first time at the prize-giving ceremony for the Los Angeles Design Challenge. The 2010 Los Angeles Design Challenge called for the creation a safe and comfortable two-plus-two configured compact car that weighs no more than 1,000 pounds (454kg). The Biome has been built to these parameters, with what Lee describes as a biofiber body that he says grows in a completely organic environment from seeds sown in a nursery and sees it tip the scales at just 875.5 pounds (394kg).